Businesses that have been cautiously waiting and watching have yet another good reason to enter the rewarding world of Unified Communications (UC). Earlier this month, Polycom, a noted partner of AVI-SPL, announced it is developing standards-based H.264 Scalable Video Coding (SVC) technology for both current and emerging UC technologies. What does that mean for you and your business? To put it simply, you can invest in UC without worrying that your infrastructure will suddenly become outdated. More to the point, you can continue to reap the benefits of UC that make it so attractive to companies like yours – its user-friendly integration of real-time communication services, including presence, email, instant messaging and video conferencing. Companies will also profit from SVC’s ability to deliver high-quality video and audio at any bandwidth. Because of SVC’s interoperability and backward compatibility, companies can protect the value of their current and future UC investments, an advantage that is especially important for small businesses that must be cautious with their budgets. Speak to a Unified Communications Expert! Overwhelmed by the need to expand your UC capabilities or just don’t know where to start with UC? Speak to an AVI-SPL representative. Complete our short needs analysis form and we’ll have a UC expert give you a call. You can also contact us at (866) 559-8197 or email us at sales@avispl.com. Today, Polycom announced plans to expand video communications solutions to the masses through its new product and service offerings specifically for mobile users, small and medium businesses (SMB), and consumers (who, up ’til now, had all been relatively left out of the video communications market). This announcement is based on Polycom’s new vision of “Unified Communications Everywhere” and its plan to open video communications to everyone on any device. Read more about Polycom’s plan to bring unified communications to everyone. Polycom and Microsoft have announced a channel partnership to increase Microsoft’s Unified Communications (UC) offerings. As a part of the multi-year global agreement, Polycom will develop and provide integrated end-to-end UC solutions, including room-based video systems, for Microsoft’s clients. 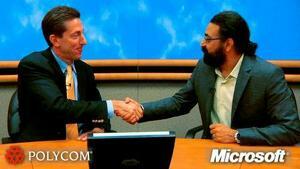 Under this partnership, Polycom becomes a member of Microsoft’s key strategic global alliance. For more information about the agreement, click here to read the announcement and watch a brief video featuring Microsoft Corporate Vice President of UC Products and Polycom President and CEO.